With all the heat emanating from the gas, accompanied with the smoke from the food, it might get difficult to breathe easy in the kitchen for a long time. V-Guard has come up with a solution to maintain the air circulation in your kitchen with the V-Guard Tidal Air Ventilating Fan. Ideal to mount on any glass window in your kitchen, this V-Guard ventilating fan will ensure that the hot air and smoke is eliminated within minutes. With a low power consumption, you can use this ventilating fan for prolonged time period. With the hot air carrying grime and oil accumulating in the kitchen, there are higher chances of the dirt settling on the ventilating fan. The V-Guard white ventilating fan is crafted from engineered plastic. This makes it extremely easy to clean without tarnishing the white colour of the fan. Also, the fan is designed in a manner that the noise level is very low. 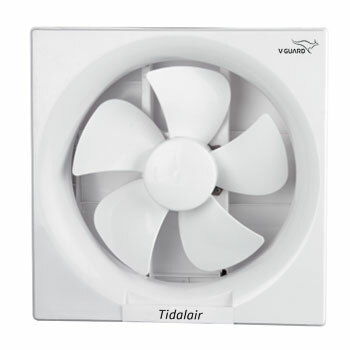 A ventilating fan is a must in modern kitchens, so get this beautifully engineered V-Guard Tidal Air Ventilating Fan for your kitchen and breathe easy.